This set of 28 Double Six Dominoes is sure to provide hours of entertainment. 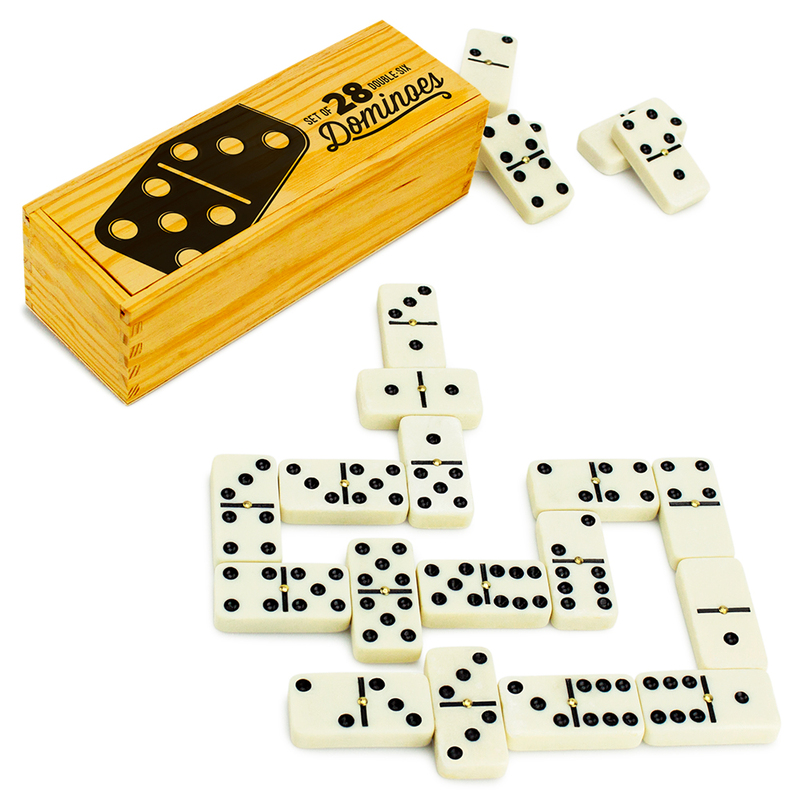 Made with brass spinners and conveniently packaged in a stylish wooden storage box, Dominoes is a game that has several variations of play. Popular since the 18th century, most domino games are blocking games, meaning the object of the game is to empty your hand while blocking your opponent from doing so. At the end of a game, scoring is based on the number of pips (spots on a domino) in the loosing player's hand. Blocking games require the use of double six dominoes. However, there are other variations of play, including scoring and drawing games. For scoring games, points are awarded based on certain configurations and moves. For drawing games, players can draw as many tiles as they want from the stack before play begins. The dominoes included within this set feature brass spinners, which were originally used when dominoes were made with ebony and ivory. The spinner was needed to hold the materials together. Today, however, spinners are mostly used for traditional appearances, to aide in shuffling so that the domino face is protected, and to help pivot dominoes during play. The wooden box included with this set measures approximately 7.75 inches long. The lid easily slides off for convenient domino access. These rough-and-tumble backyard buds love to fall in line! Drop the red ball down the starting ramp and get ready for the domino adventure! How did you set the dominoes up this time? Are there lots of twisty turns, or did you strrretch them out long and straight? Look how quickly they all tumble and fall! Did you add the steps? They're Frannie the Frog's favorite! Isn't it fun that the dominoes can climb stairs just like you? Ding! There goes the bell! That's Percival the Puppy's favorite piece. He loves meeting new people when they ding the doorbell at his house! Why You'll Love It: There are hours and hours of stimulating, open-ended play packing into a playset. Kids can get creative, matching colors and animals, building up the blocks, and integrating the special stunt pieces. Construct a snaking spiral, assemble (and topple!) a tall castle--your child will never create the same layout twice! Dominoes are ideal tools to help kids explore motion, kinetic energy, and cause-and-effect relationships. They're also a fun, simple way to build fine motor skills and dexterity. We have a hunch your child will really fall for them! What's in the Box? 110 pieces, including four friendly backyard pals, six fun colors, and four exciting stunts: steps, a bridge, a swinging bell, and ramp. Each domino measures approximately 2" tall, 1" wide, and .25" thick. 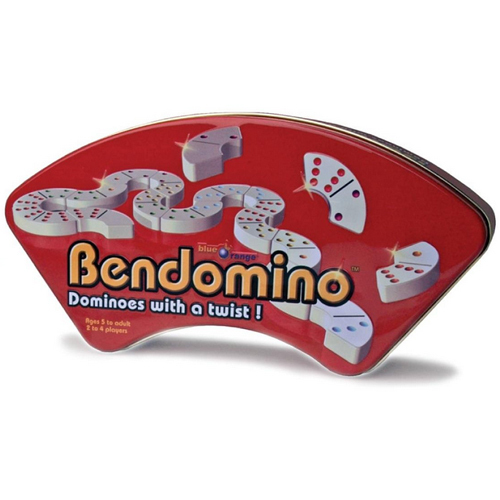 Body is made of detailed hand painted resin..Includes one set of Double-Six Dominoes..Great fun item..Keeps your child entertained and engaged..Great gifts for your little adorable ones..
Based on the popular brand from the 1980s, Domino Rally is back and better than ever! 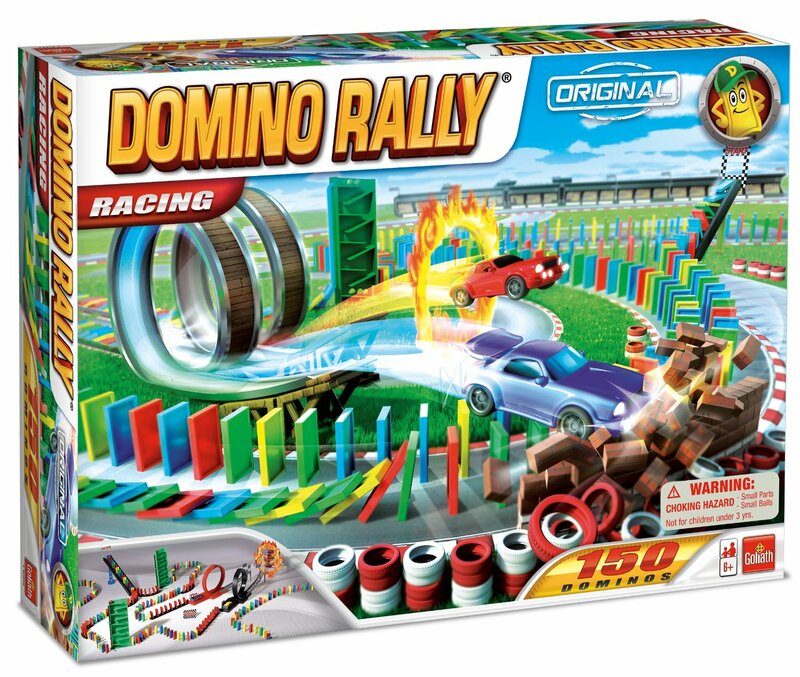 This original Domino Rally Racing set is packed with 100 dominoes and 50 specially-crafted pieces to help you build the best stunts ever. Featuring two loop de loops, two domino race cars, a ring of fire, custom domino tracks, and one tall launching bridge, this set is sure to provide hours of entertainment. Players can start together and race to see whose car goes through the ring of fire first. Each item is recommended for ages 6 and up. 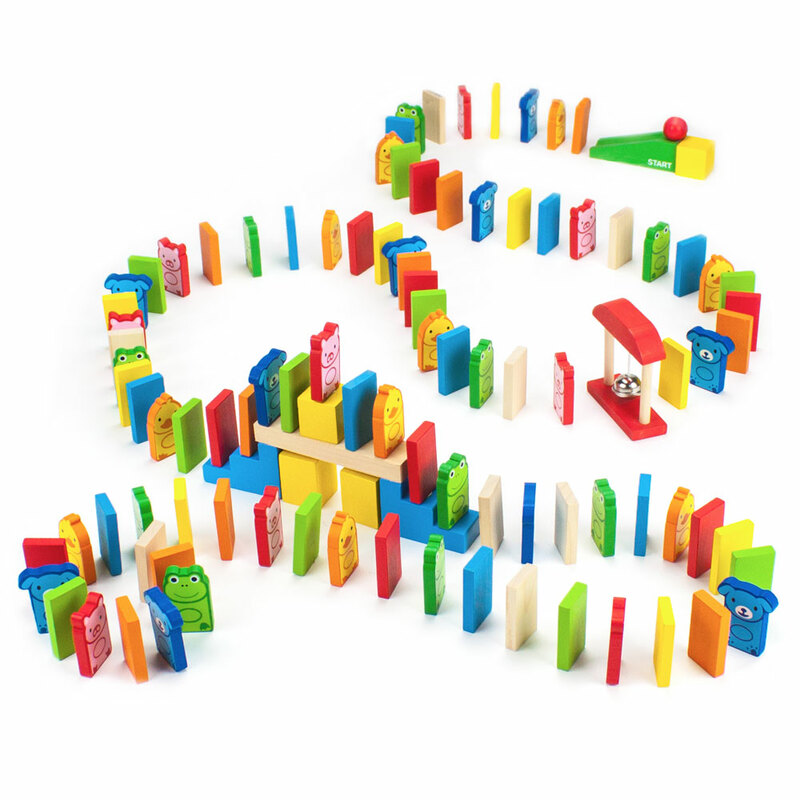 All Domino Rally Sets (Each SOLD SEPARATELY) work together to form gigantic domino creations! Easily store and display your dominos during game play with this set of two plastic domino trays. Made from durable plastic with secure, slanted slots, each tray has the capability to hold up to 44 dominos. With these trays, you will no longer will you have to worry about dominos falling over or becoming unorganized during a game. Each tray measures approximately 12 inches long and 4 3/4 inches wide. Based on the popular brand from the 1980s, Domino Rally is back and better than ever! This original Domino Rally Classic set is packed with 80 dominoes and 35 specially-crafted pieces to help you build the best stunts ever. Featuring, four custom domino tracks and one loop de loop, this set is sure to provide hours of entertainment. Each item is recommended for ages 6 and up. 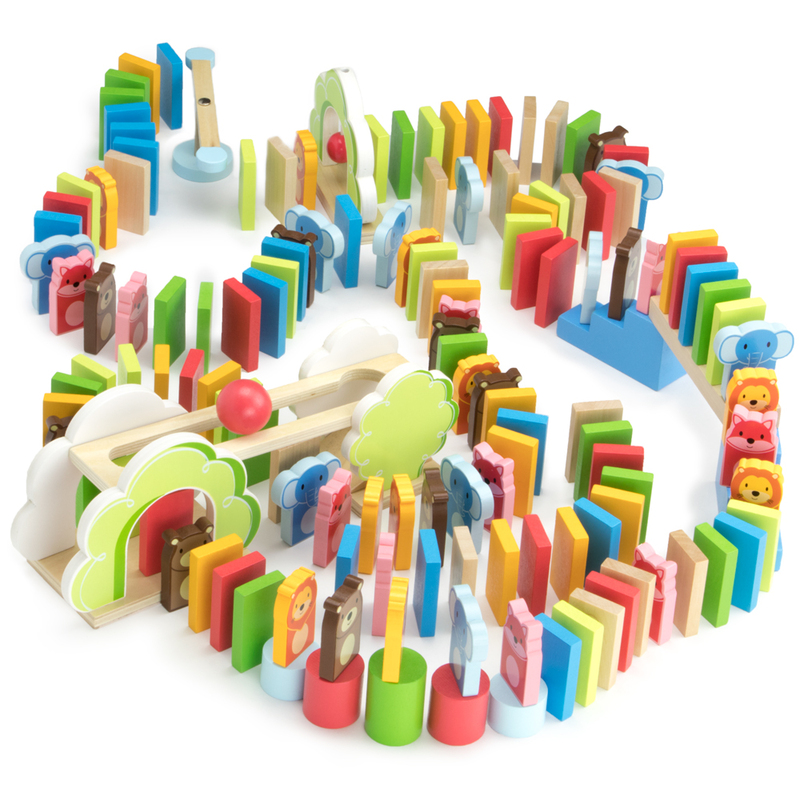 All Domino Rally Sets (Each SOLD SEPARATELY) work together to form gigantic domino creations! If you like playing traditional dominos, you will love Bendomino. Played similarly to regular dominos, Bendomino features a curved design that allows more control over the game. Depending on your strategy, you can play the game in an open or closed manner. Bendomino is a game of strategy, luck and good times. ItG+™s fun for the whole family and can help improve visual perception, hand-eye coordination and shape recognition. This game is suggested for two to four players ages six and up. Each game lasts about 10 to 20 minutes. 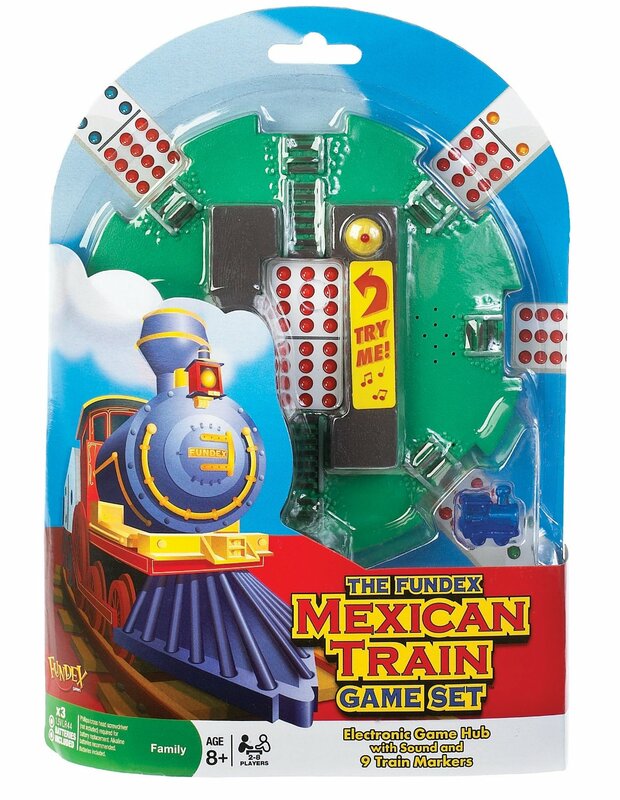 The Mexican Train Game in a tin storage container comes with everything you need for hours of train-building fun! Build your train out from the station hub and if you're the first to play all of your dominoes, or to play a domino on the Mexican train, you win! During game play, each player picks a certain amount of dominoes to start the game. The object is to form a path called a train that starts from the game's electronic center hub. The player who plays the center domino plays off the twelve domino to start their train. If they don't have a move, they take a domino from the leftovers pile. If the new domino doesn't have a play, that player marks their train open with train marker. 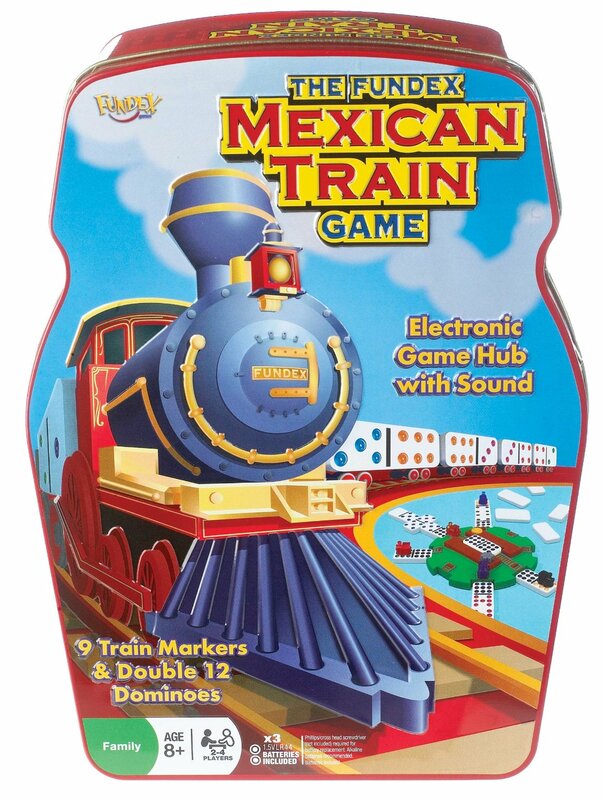 Once each player has started their train, they can either play on their own train, start the "Mexican" train in one of the empty slots by playing off the center domino or play on another player's train if it has a train marker. Each round lasts until a player has played all their dominoes and receives a score of (0) for that round. The other players count their remaining domino values for their round score. Points from all 13 rounds are tallied at the end and the lowest score wins! The winner of the game then gets the honor of pressing the center domino to hear the "Toot Toot" from the electronic game hub. This game comes with a 3-D electronic game hub, a set of color-dot double 12 dominoes (91 dominoes total), nine train game pieces, and instructions. This game is recommended for 2-4 players ages 8 and up. It requires three 1.5VLR44 batteries, which are included. 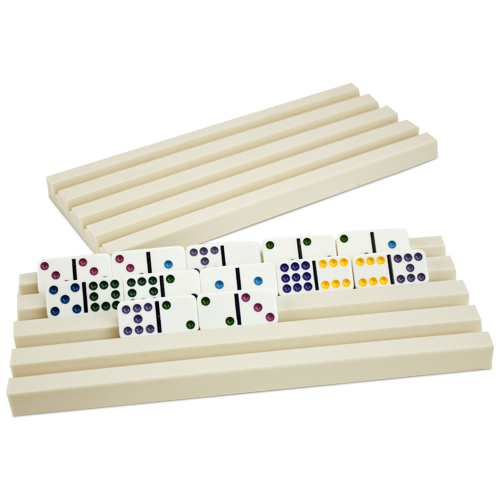 The Mexican Train Game Set is the complete accessory set for playing Mexican Train dominoes. This set includes everything you need to turn any set of double twelve dominoes (not included) into the widely popular Mexican Train Game. Each set comes with a 3-D electronic game hub, instructions, and nine train game pieces. This item is recommended for 2-8 players ages 8 and up. Based on the popular brand from the 1980s, Domino Rally is back and better than ever! 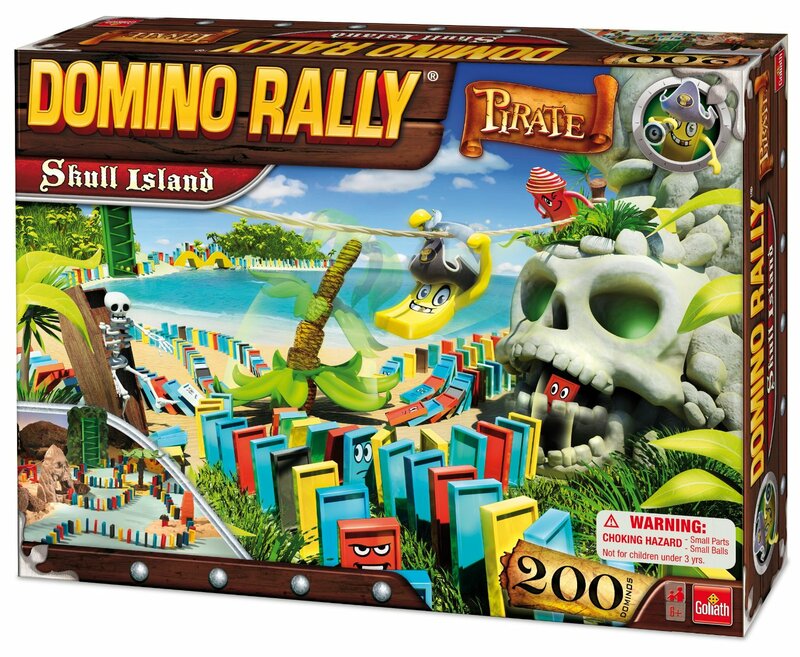 This Pirate Skull Island Domino Set features 200 dominoes that allow you to build a plethora of pirate-themed stunts. From the classic zig zag tower to the camelback stairs, this set has it all. Several new stunts, such as the plunging palm tree, zip line of doom, clumsy casket and the chomping skull cave are also included. 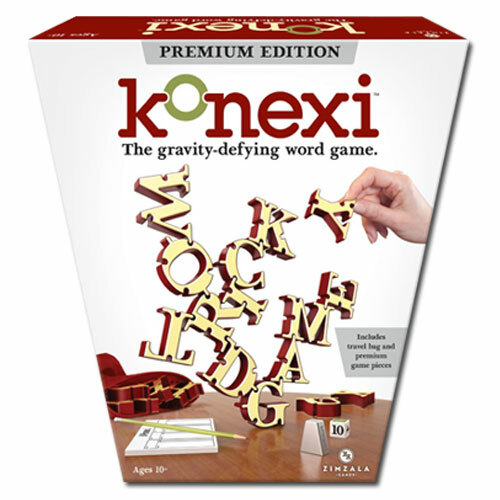 Konexi is the 3D word-building game that will have you pushing your luck and on the edge of your seat! Take turns adding letters to a teetering tower of words. Go for longer words - upward, downward, or sideways - to score more points. But watch out...the next letter may cause gravity to kick in and a Konexi collapse! It's thrilling fun for the whole family! For ages 10 and up. 2-4 players. Carefully set up each domino one by one, then drop the red ball down the starting ramp, and get ready for another domino adventure! Look how quickly they all tumble and fall! Have you tried the windmill? Bonnie adores that one! IsnG++t it fun how dominoes can push the blades and make it spin? And make sure you let Leonard go through the tunnel pieces! ThatG++s his favorite thing to do. DonG++t forget to set up the spinner piece. There are so many ways to play with all these new stunt pieces! Dominoes make for an excellent early STEM toy. Kids can get creative, matching colors and animals, building and stacking, all while exploring the concepts of motion, kinetic energy, and cause-and-effect relationships. This domino adventure set packs a whopping 144 pieces into its reusable carry box! Stack up 4 brand-new zoo pals and six colors of dominoes, then mix in a dozen exciting stunts for hours of fun and stimulation. You'll never make the same layout twice. No two campaigns take the same shape, but all too often we're stuck carving dungeons out of the same square mat. But you? You've invested a few points into Cartomancy, and with the Master's Atlas in hand, you're ready to build a sprawling, unpredictable, PC-confounding labyrinth. Inside this box you'll find 44 reversible map tiles in three shapes and sizes. Choose your finish: blank white or parchment, then piece your map together using narrow hallways, large clearings, and tiny closets. Draw in dry or wet erase details, and finish with our hand illustrated object tokens. Whether your adventurers are seeking a dragon to slay or playing cat and mouse in the halls of a rambunctious goblin king, keep them on their toes with these modular tiles. Construct a massive arena for the inevitable pit-fighting subplot. Erect a Gothic stronghold for your players' vampiric nemesis. Or cobble together a dungeon on the fly! Every Dungeon Master is unique. And now, so is every dungeon. Match and win! Dominoes is a simple, fun game that is a great tool for developing cognitive skills like sorting, matching, and arithmetic. 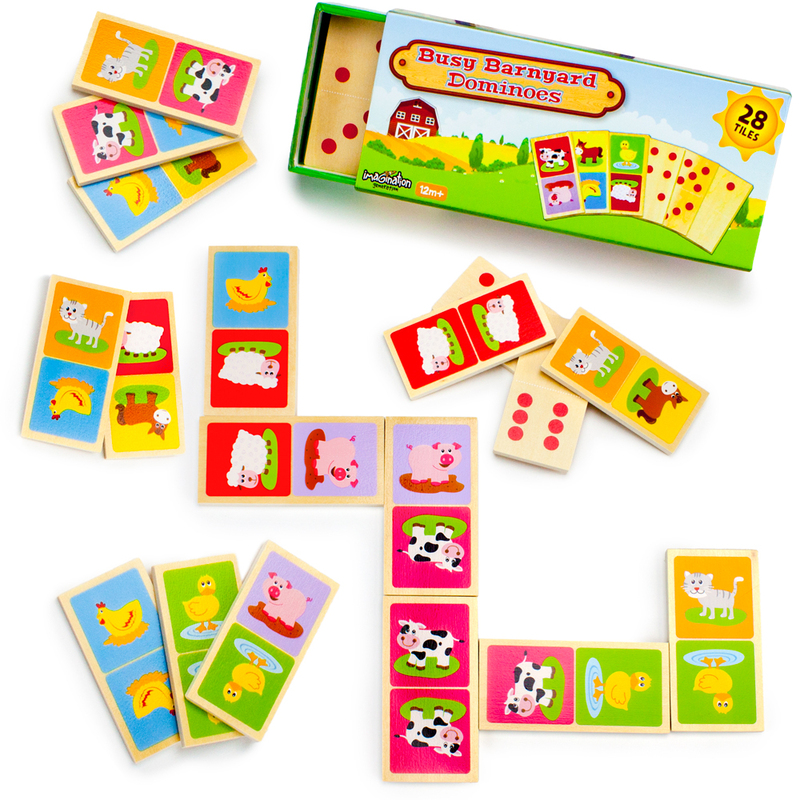 Play the classic game with pipped numbers, or for younger learners, match up colorful barnyard animals! Each wooden tile is finished with water-based paint and stores in the tough matchbox-style game box. For 2-4 players. Games are easy to pick up and take just 5-10 minutes. Includes instructions for playing both classic and matching games, as well as 28 wooden tiles. Based on the popular brand from the 1980s, Domino Rally is back and better than ever! 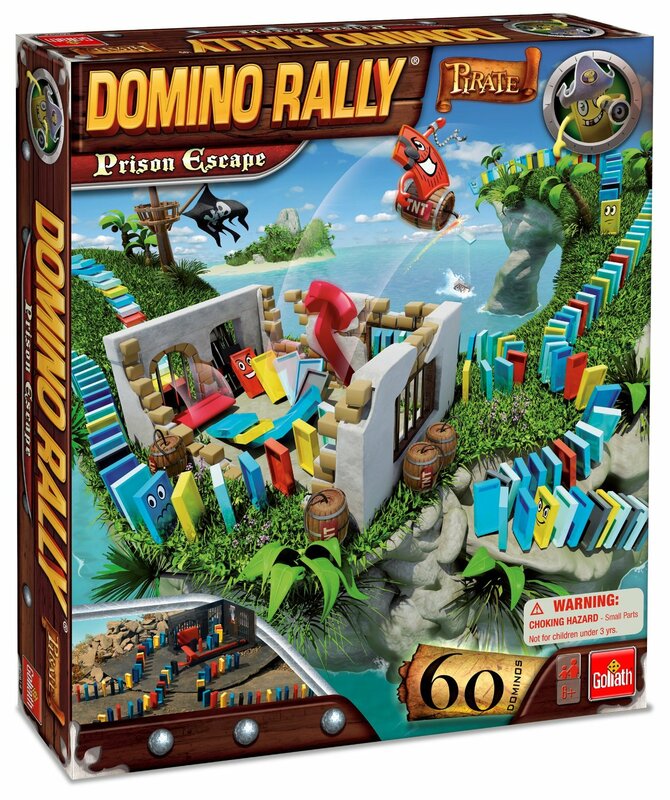 This Domino Rally Pirate Prison Escape Set is packed with 60 dominoes and three new stunts. Known as the "starter" set of the Pirate Edition, this kit features three stunts such as the escape catapult, prisoner platform and falling door. Based on the popular brand from the 1980s, Domino Rally is back and better than ever! 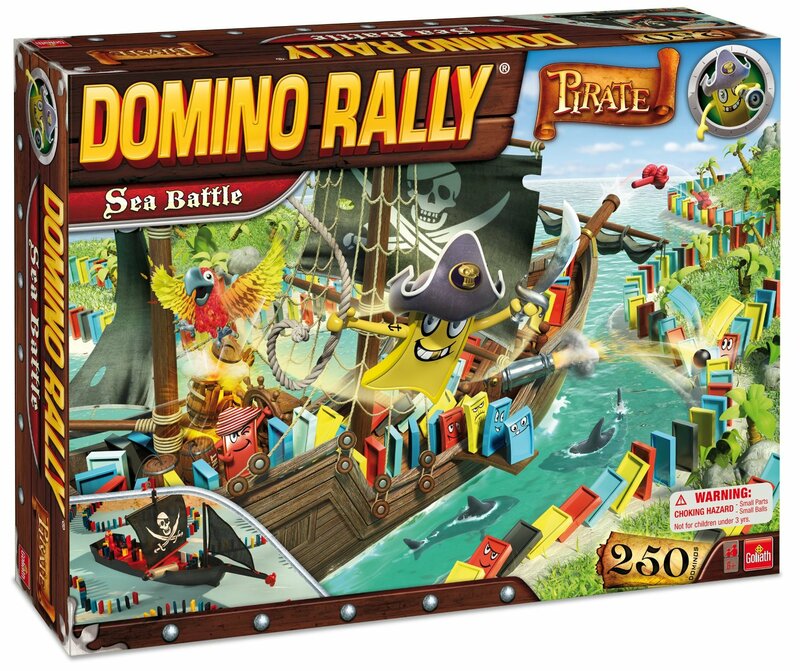 This Domino Rally Pirate Sea Battle Set includes 250 dominoes and four new stunts. Featuring a pirate ship that can be played in multiple pieces, or as one gigantic piece, this set contains stunts such as a canon, a plank, a flying parrot and falling sail. Based on the popular brand from the 1980s, Domino Rally is back and better than ever! 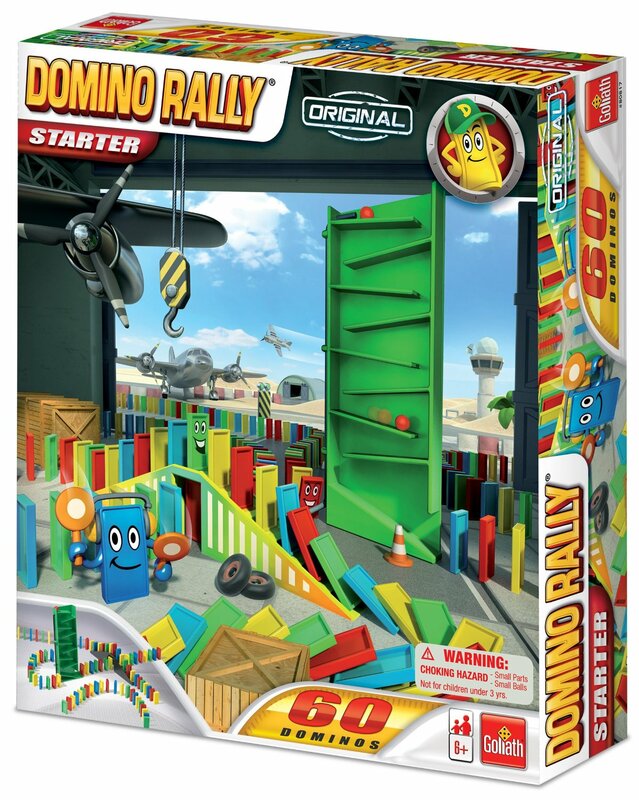 This Domino Rally Starter Set includes 60 dominoes and three new stunts. Featuring a domino bridge, a slalom ball drop and a zig zag tower, this set is sure to provide hours of entertainment. This fun starter set is a great way to introduce children to the fun world of domino-building and falling! 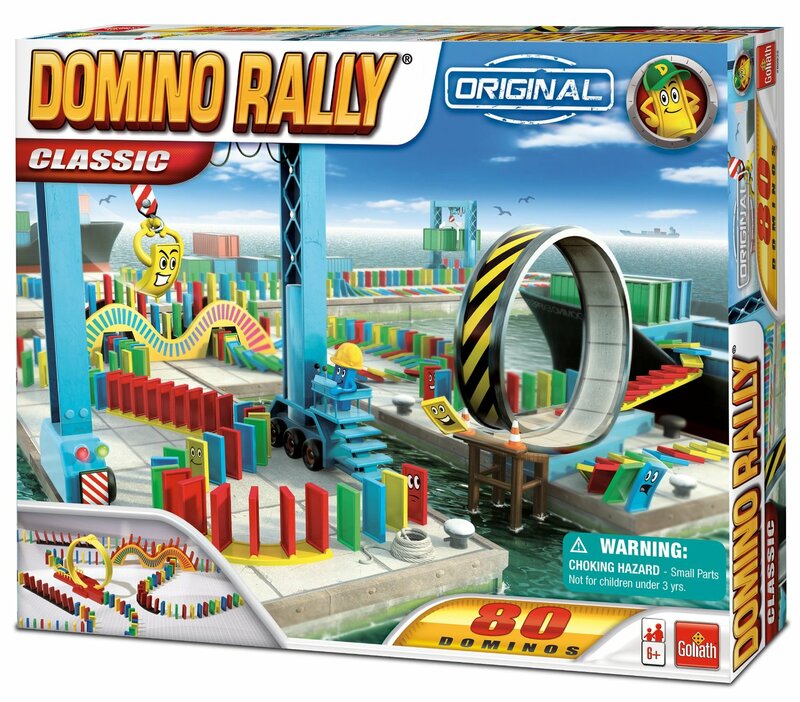 Based on the popular brand from the 1980s, Domino Rally is back and better than ever! 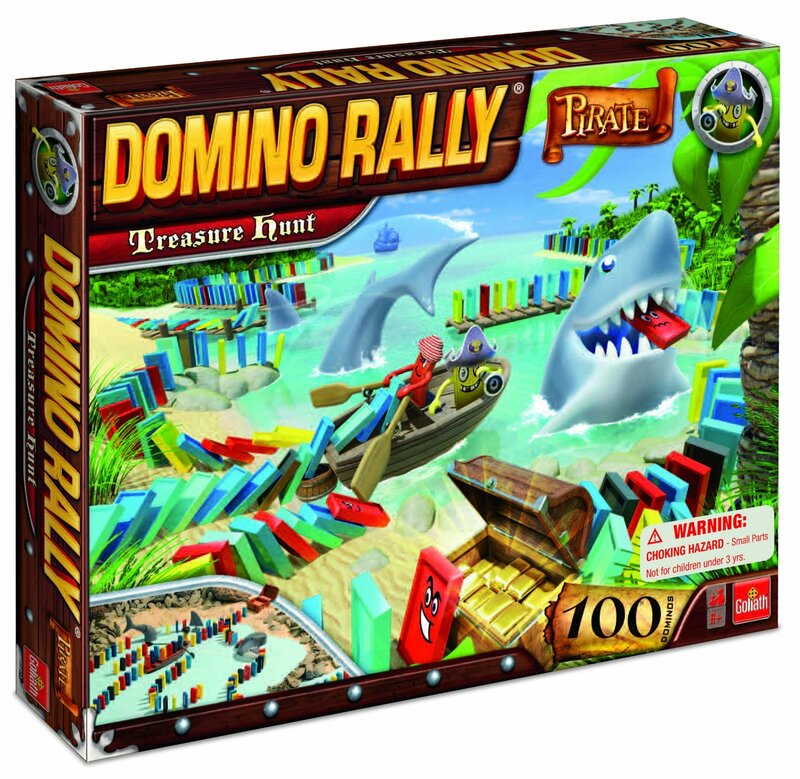 This Domino Rally Pirate Treasure Hunt Set includes 100 dominoes and four new stunts. Kids will have a blast setting up stunts such as the a chomping shark head, row boat stair, spinning fin and the whacking shark tail. Based on the popular brand from the 1980s, Domino Rally is back and better than ever! 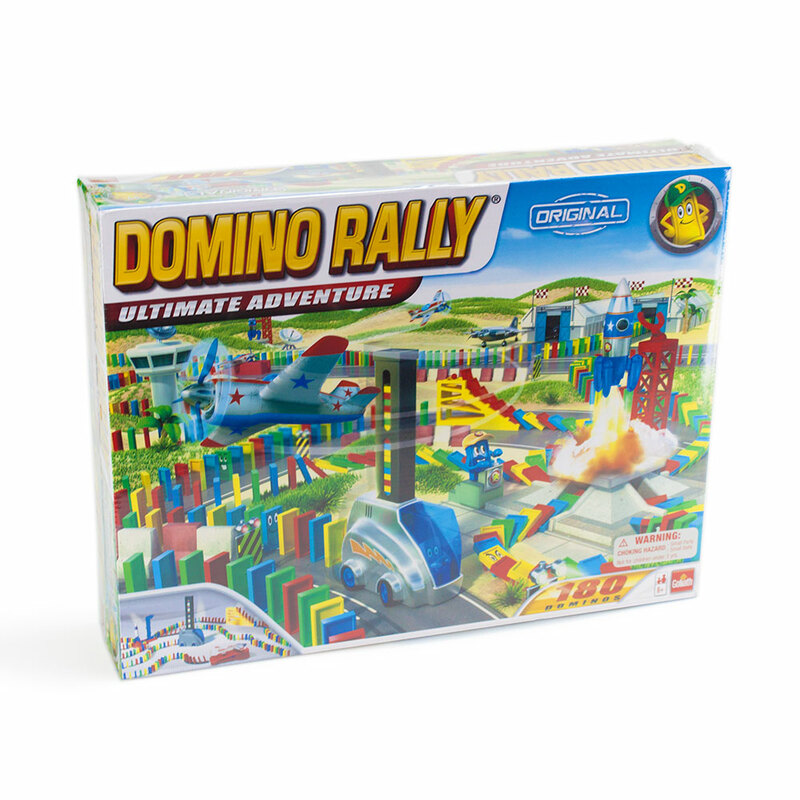 This Domino Rally Ultimate Adventure Set comes with 180 dominoes and tons of new stunts and tricks! Kids will love building the rocket tower, zig zag stairs and a plane launcher. Each set also comes with two curved and two straight track pieces. Hive is similar to the game of chess, but is played with easier rules. Hive is played with highly tactile Bakelite tiles. The object of the game is to be the first player to surround your opponents G++Queen BeeG+- with your own creatures, as well those of your opponent's color. The tile pieces are nice and heavy, so there is no game board needed. Hive is a versatile game that can be played almost anywhere. 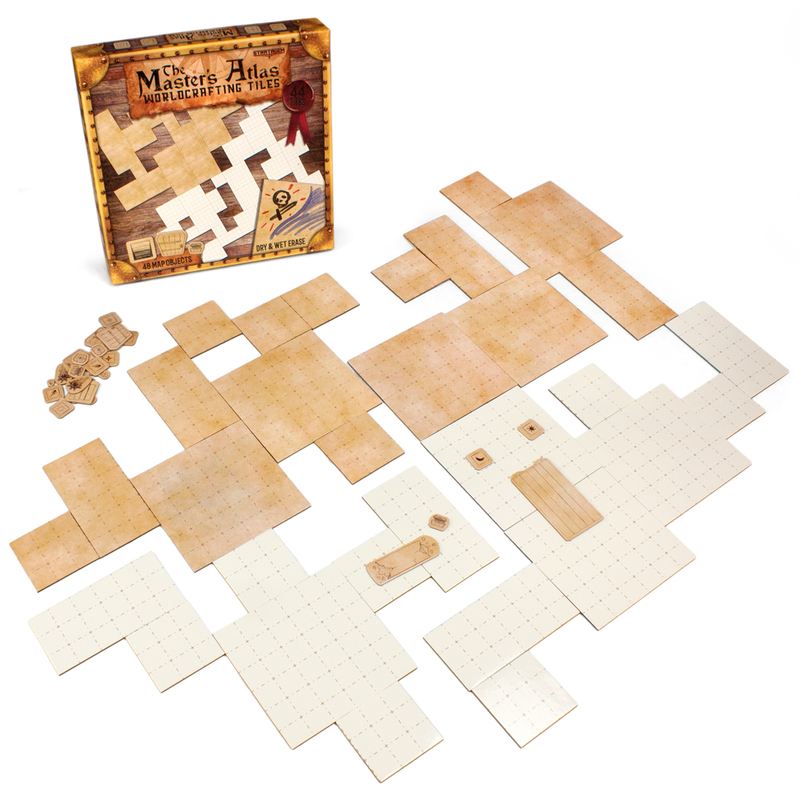 Each game comes with 22 tiles, and illustrated rules. Hive has won numerous awards including the Dr. Toy Smart Play Smart Toy award. It was also a national competition winner by Mensa Select. 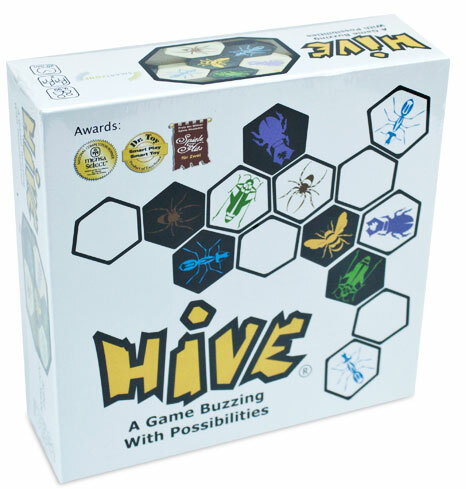 Hive is designed for two players ages 9 and up. The average playing time is about 20 minutes.